"If you're a jazz-following audiophile, go buy this right away. Flummoxed by the price tag? How much would you pay for the most palpable illusion you'll ever experience that Pops and the First Lady of Song are back among the living—standing, breathing, singing, and blowing, right in front of you? ... It's the only QRP Verve I've heard so far, but if it's a harbinger of things to come, it's what Satch would call a mitzvah! "Fred Kaplan, stereophile. 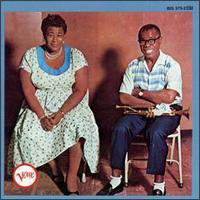 The very fact that America's biggest jazz label called one of their albums quite simply Ella and Louis indicates that we are talking about something very special here. And surely enough has been said - "Satchmo" and the grande dame of jazz certainly need no further introduction. In the '50s just the mere mention of their forenames was enough to light up the eyes of jazz fans. A glance at the tracklist reveals that tranquility rules the day: wild stomps and improvised scats will neither be sought nor missed. Of prime importance to the jazz ballad is a feeling of 'letting oneself drift' in the inspiration which gushes forth from the minds of genial American songwriters. This is no contest - for the artists all pursue a common goal with extreme sensitiveness. The background combo, made up of first-class musicians and led by Oscar Peterson, performs with great concentration and almost obtrusive unobtrusiveness. Verve's highly successful producer Norman Granz decided quite deliberately to make the recording in the studio instead of at a live session. And success has verified his judgment, for such vocal jazz knows only gentle tones - but the result is all the more intensive for that. Ella and Louis is an inspired collaboration, masterminded by producer Norman Granz. Both artists were riding high at this stage in their careers, and Granz assembled a stellar quartet of Oscar Peterson (piano), Buddy Rich (drums), Herb Ellis (guitar) and Ray Brown (bass). Equally inspired was the choice of material, with the gruffness of Armstrong's voice blending like magic with Fitzgerald's stunningly silky delivery. Outstanding are Irving Berlin's "Cheek to Cheek" and "Isn't This a Lovely Day," and everything else works like a dream, with the golden star going to the Gershwin brothers' "They Can't Take That Away from Me." Gentle and sincere, this is deserving of a place in every home.